(another rare off-topic post) The State of the NFL…is just fine, thank you very much. 2017 highest rated NFL games- oh, the NFL is in trouble…NOT! Is all that stuff about ratings being down equivalent to this: “the world’s richest man WAS worth 210 billion dollars…now, he is “only” worth 208 billion”? “The NFL isn’t in a vacuum, as the viewership drop is indicative of the general environment as less television is being watched and cable subscriptions have declined. 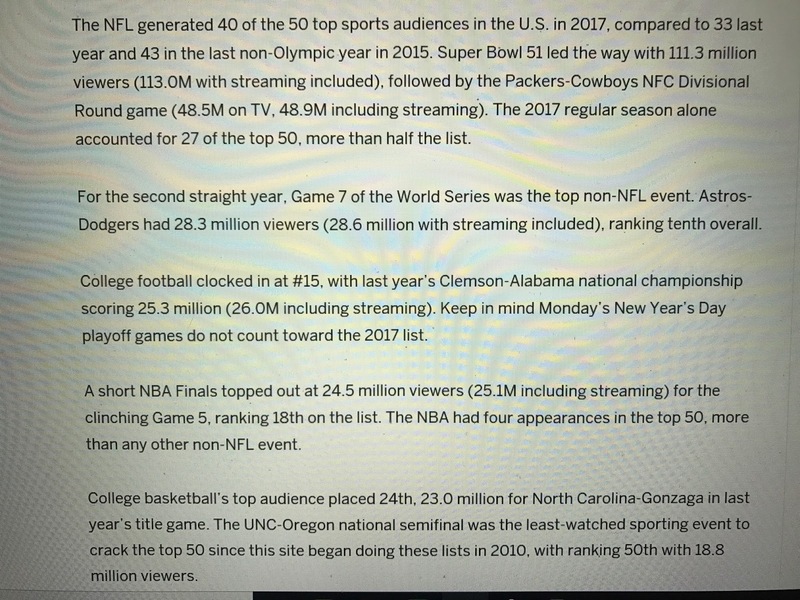 Despite the drop in NFL ratings, Nielsen data shows that the 20 of the 30 highest-rated shows on television in 2017 were football games. Both NBC and ESPN had the most-watched shows every single week, in terms of audience and in all key male demographics, for Sunday Night Football and Monday Night Football games this season. NBC’s Sunday Night Football finished first in prime time this fall for the seventh consecutive year, besting “American Idol” (2005-06 through 2010-11) for the longest hold on the top prime-time spot since 1950. Its 18.2 million viewers beat the second-best prime-time show, Thursday Night Football on CBS, by 29 percent — its largest margin ever. “All that being said, it’s important to remember that NFL games still dominate other live programming. 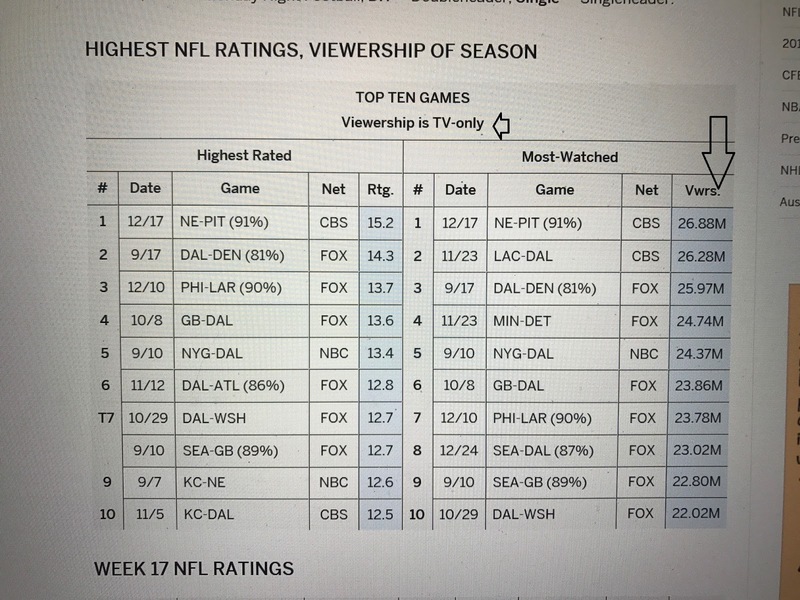 44 of the best-rated primetime TV programs of 2017 were NFL games. So think of it this way: primetime NFL games, for years and years, delivered outstanding ratings; now they deliver just very good ratings. As Wasserman advertising executive Elizabeth Lindsey told Yahoo Finance this year, “Football is football.” To big advertisers, the NFL is still the best game in town for reaching lots of eyeballs.